Niagara Falls, NY - Moderator Rick Pfeiffer talks with a few of the candidates before the debate. The Niagara Gazette hosted a City Council Candidates Debate at the Niagara Falls Public Library between candidates, from left, Sam Archie, Kristen Grandinetti, William Kennedy, Andrew Touma, Robert Pascoal and Chris Voccio. 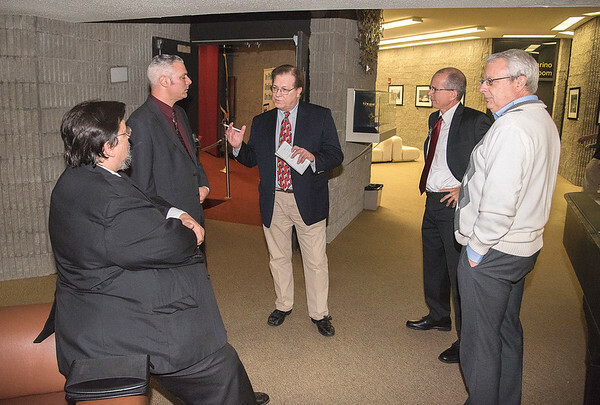 The event was hosted by Niagara Gazette Reporter Rick Pfeiffer and moderated by Niagara Gazette Regional News Director Mark Scheer and WJJL's Tom Darro.